Minimising friction in the customer experience is crucial to conversion rate optimisation and so user experience tools that show you where and how your visitors interact with your site can provide valuable insights into where the pain points are in your customer journey. 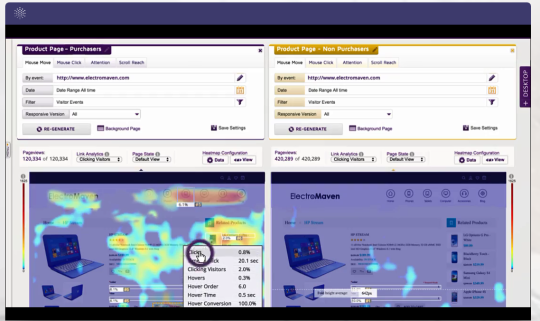 User experience tools allow you to watch real customers browse your site and produce click and mouse movement heatmaps to understand where they interact with a screen. You can also create and track conversion funnels so that you can see where the big drop-off points are on your site. Form analytics tell you which input fields visitors often miss out and exactly how long each input field takes to complete. Some user experience tools also provide on-site polls and surveys as well. This is why user experience tools are hugely useful for conversion optimisation and a must for anyone wanting to better understand the customer experience. At one time user experience tools would cost thousands of pounds a month, but now suppliers such as Hotjar are offering solutions priced at less than £100 a month. They have expanded the market by targeting small and medium sized organisations. For native apps there are user experience tools like Appsee and UXcam to understand your mobile customer experience. 1. Appsee: One of the most established mobile app user experience tools on the market. 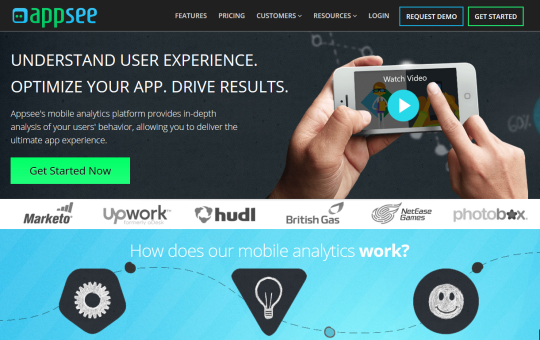 This records user sessions, touch heatmaps, crash recordings, conversion funnels and provides in-app analytics reporting. Appsee captures screen taps, swipes and action using an SDK integrated into your app. Advanced filters allow you to find the most interesting recordings to understand what makes users abandon registration or how loyal users interact with your app. You can control the ratio of recorded users and choose to record specific users based on the screen they visit, their demographics, OS version and more. Offers two plans, with a 14 day Free trial on the Premium plan. No prices displayed on their website. 2. Flightrecorder (Now part of Click Tale): A mobile app analytics platform which provides screen recordings of user actions, touch heatmaps, crash reports and app analytics reporting. No pricing information as the solution is now Click Tale for Apps. 3. UXCam: A mobile app analytics tool which automatically captures screen recordings, and touch interactions on your app to provide heatmaps and identify user drop-off points. Offers two plans. Up to 20,000 monthly user sessions for $59 a month and up to 100,000 sessions for $249 a month. 1. 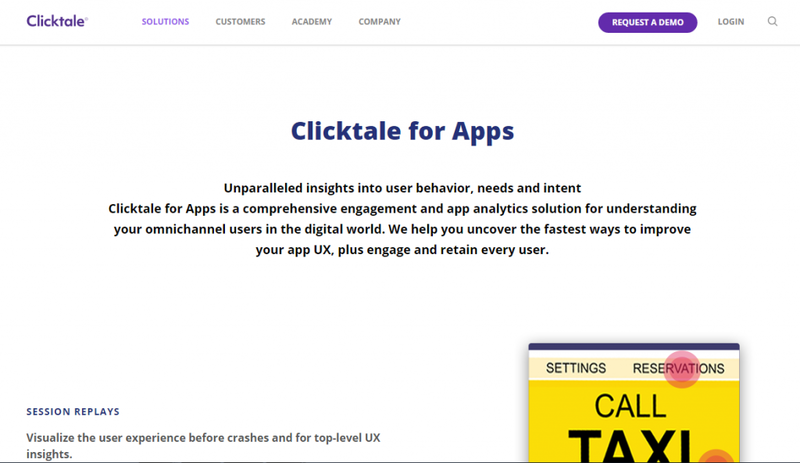 ClickTale: Probably the most well known supplier of user experience tools, Click Tale offers a full suite of solutions, including heatmaps (mouse moves, clicks, attention, scroll reach & link analytics), session playback recordings, real-time monitor, conversion funnels, and form analytics, Plus with the acquisition of Flightrecorder it now has full app analytics reporting as well. For websites the advanced filtering feature allows you to search for recordings of specific scenarios or events and segment your heatmaps (e.g.by new and returning visitors). The page console provides you with in-page web analytics about any individual page including engagement time, time on the page, page views, the bounce rate and lots more. Site reports can also be generated to show pages by load speed, engagement, clicks, scroll reach and errors. It is capable of integrating with A/B testing tools such as Maxymiser to allow you to compare visitor behaviour between test variants. No pricing information is displayed on their site, but the cost is mainly based on page views. Data is saved for 30 or 60 days. 2. 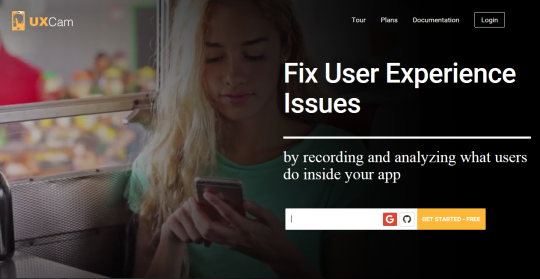 ConvTiger: A new entrant into the market for user experience tools, ConvTiger provides a session recording tool that focuses on observing how your visitors browse and navigate around your site. Price: A Free basic plan offers up to 50 recordings for a single website. The Standard plan costs €19 a month for up to 500 recordings on a single website and stores data for 14 days. For a more comprehensive offering the Premium plan costs €79 a month for up to 5,000 recordings, covers 3 websites and stores data for 30 days. The Platinum plan at €229 provides up to 20,000 recordings over up to 10 websites and stores data for 90 days. An enterprise plan is also available on request. 3. 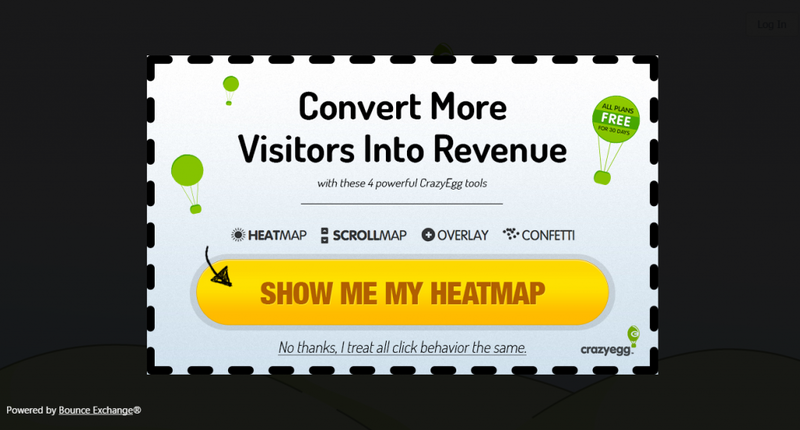 Crazy Egg: Primarily a heatmap tool that shows clicks, mouse movements, and scroll maps. The overlay tool shows you the number of clicks on each element on the page and Confetti displays every click on a page segmented by source of traffic. It is able to handle multiple domains, iFrames and flash objects. All plans are Free for the first 30 days, but if you to to Toole.io you can get 3 months free. The Basic plan costs just $9 a month for up to 10,000 visits a month, 10 active pages and daily reports. The Standard plan which is priced at $19 a month goes up to 25,000 visits per month and 20 active pages. Pro, their most comprehensive plan costs $99 a month and offers up to 250,000 visits per month, up to 100 active pages, hourly reporting, advanced filtering, mobile heatmaps and multiple users. 4. Decibel Insight: An enterprise user experience tool with a full suite of solutions including dynamic heatmaps (clicks, attention, scroll, time and attribution), session recordings, form analytics, advanced segmentation, and email alerts. Attribution heatmaps enable you to map interactions to content, and monitor clicks, goals and revenue. The time heatmaps allows analysis of visitor behaviour during your sites busiest time to spot and target the dead time. 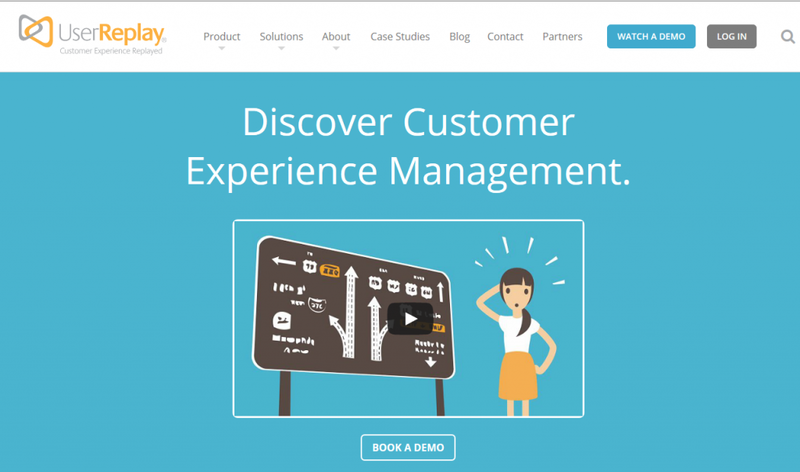 The session recordings accurately records dynamic content interaction, drop-downs, responsive sites, carousels & forms. Decibel Insight also offers a mobile solution, and integrates with web analytics, voice of the customer and A/B testing tools. pre-built channels. Sessions recordings are kept for just 7 days and data is retained for 1 month. 5. Hotjar: Probably the fastest growing of the new user experience tools as it offers a great suite of features at a competitive price. 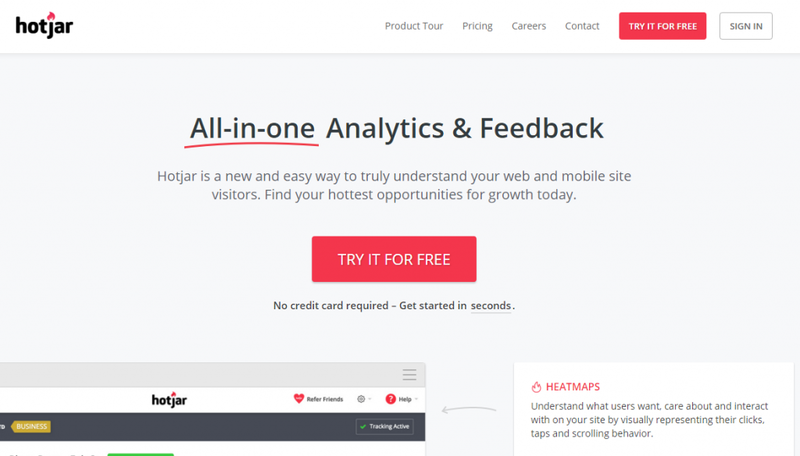 Hotjar offers standard heatmaps, form analytics, session replays, conversion funnels, surveys, feedback polls and recruits user testers. For more details see my review of Hotjar and sign up for free if you have less than 2,000 page views per day. The Basic Free plan samples up to 2,000 page views per day, 300 session recordings, 3 funnels, up to 1,000 visitors per heatmap and forms, plus 3 polls, surveys and recruiters. The Business plan is priced on a sliding scale based upon daily page views. This starts from €89 a month for up to 20,000 views a day and goes up €589 a month for up to 400,000 views a day. 6. 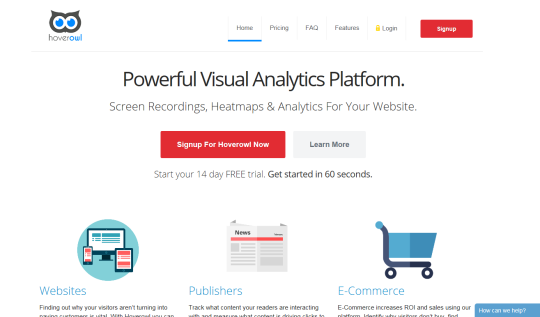 Hoverowl: A heatmap and session recordings provider which supports all devices. Their advanced heat mapping and session recording system tracks and separates reports for each type of device. 14 day Free trial available for all four plans. The Elf Owl plan costs $12 a month and captures up to 3,000 session recordings and heatmap visitors a month. Saves recordings for 30 days. The Wise Owl plan costs $99 per month and captures 250,000 recordings and heatmap visitors per month. Retains recordings for 60 days. Conversion funnels allow you to define a series of pages that leads towards a goal. Form analytics features a hesitation report which shows how much time on average visitors are hesitating on each input field. The hesitation algorithm tracks a variety of signals that helps to determine whether a visitor is engaged or hesitating. 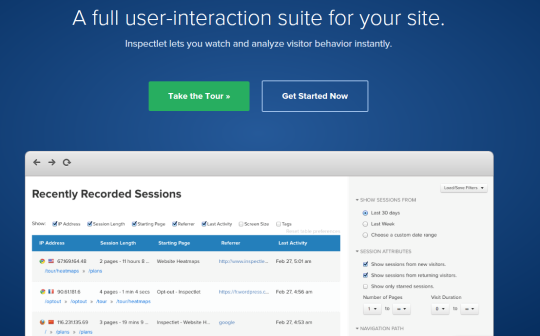 Inspectlet has a Free plan for a single website, and up to 100 session recordings a month together with the heatmap suite. The Micro plan costs $39 per month (up to 5,000 recordings) for a single website and account user. Accelerate is their more comprehensive plan which is priced at $299 a month (up to 125,000 recordings & 20 websites). This plan allows for multiple account users and provides conversion funnel analytics and in-depth form analytics. They also offer an Enterprise plan for larger organisations. 8. 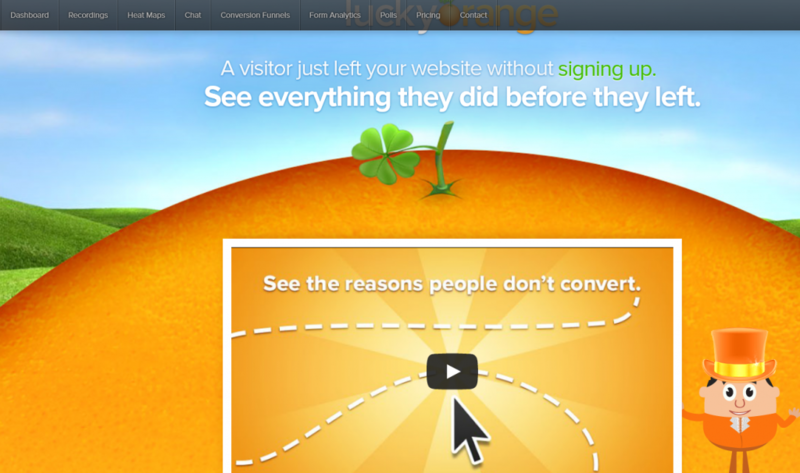 Luckyorange: Offers a full package including heatmaps (mouse movements, clicks and scrolls), session recordings, conversion funnels, form analytics, live chat and visitor polls. The dashboard allows you to monitor real-time analytics to see how many people are on your site, compare historical statistics and see what keywords, locations, referrers, tweets, languages and more are driving traffic and behaviour on your site. The session recordings feature allows you to search by behavioural tags so that you can see for example visitors who abandon their basket or visited a product page but did not check-out. The form analytics provides data on which fields are most often the last abandoned, time to start, time spent on each field, the order visitors filled out each field and which fields are repeated the most. 7 day Free trial available on the Small plan. The Small plan costs $10 per month and gives you up to 50,000 page view per month across 3 sites and data is stored for 30 days. The X-Large plans is priced at $100 a month for 100,000 page views and 25 sites. All visitors are recorded until the monthly maximum is reached and will not re-start until you either upgrade or the month ends. 9. Mouseflow: A comprehensive user experience tool with heatmaps (move movements, clicks and scrolls), session recordings (including mobile gestures), link analytics, and form analytics. The form analytics lets you watch visitors’ keystrokes and how the form fills as they interact with your site. Offers a limited Free plan for up to 100 recordings a month for a single website. Subscription plans start with the Small plan for $15 a month. This provides up to 1,000 recorded sessions for one website and a month’s storage of data. The Extra Large plan costs $299 a month and gives you up to 100,000 recorded sessions for 30 websites and 3 months storage. An enterprise plan is also available for over a million recorded sessions. 10. 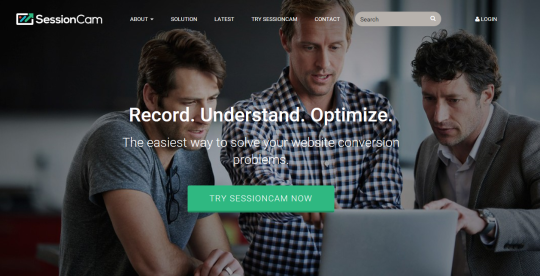 Sessioncam: A full service tool which offers heatmaps (mouse movements, clicks, scrolls and browser attention), session recordings (including from mobile devices) , conversion funnels, and form analytics. You can use their API to feed data recorded in real-time by Sessioncam into your own CRM systems to respond automatically to targeted events. Sessioncam also integrates with third party solutions such as Google Analytics, Campaign Monitor, Cheetahmail and Olark. Sessioncam targets organisations with over 500,000 page impressions a month and does not display any pricing on its site. Cost is based upon page impressions. 11. 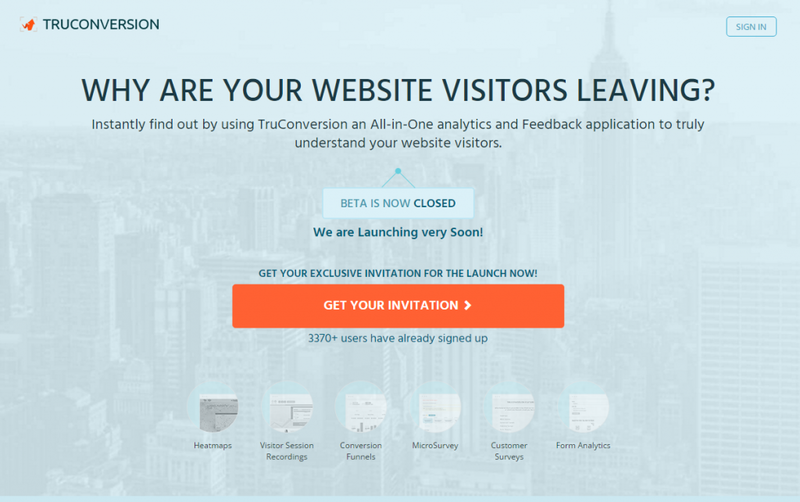 TruConversion: A recently launched user experience tool offers a comprehensive range of tools including session recordings, heatmaps, user polls and surveys, form analytics, and conversion funnels. Pricing: The Basic plan costs just $41 a month for up to 110,000 monthly page views. The Plus plan costs $83 a month for up to 275,000 monthly page views and the Pro plan is $149 a month for up to 550,000 monthly page views. your website. UserReplay is particularly good for helping resolve customer disputes, fraud prevention and abandon basket issues. No pricing information is displayed on their website. Wow, you’ve got to the end of my post, well done! Thank you and if you found it useful please share using the social media icons on this page.